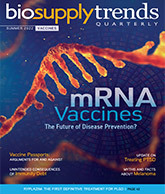 BioSupply Trends Quarterly (BSTQ) launched in July, 2009. BSTQ is the definitive source for industry trends, news and information for the biopharmaceuticals marketplace. Each issue focuses on topics ranging from product breakthroughs, industry insights and innovations, the latest editorials on clinical trials, accessibility, and service and safety concerns. Featuring in-depth profiles on the leaders and trailblazers within the biopharmaceuticals industry, readers will also find informative columns, research updates, product news, a valuable reference guide and current reimbursement rates.